Taiwanese President Tsai Ing-Wen, U.S. Representative Ed Royce, and U.S. Congresswoman Judy Chu attend the Los Angeles Overseas Chinese Banquet in Los Angeles, Aug. 12, 2018. The Taiwanese president's unusually high-profile trip to the United States this month boosted her image at home but enraged Beijing, sparking China's boycott of a Taiwanese-owned coffee shop chain and possibly the latest loss of a diplomatic ally. Tsai Ing-wen gave a speech August 13 in Los Angeles and on Sunday became the first Taiwanese president since the 1970s to visit a federal facility when she toured the NASA Johnson Space Center in Houston. Tsai’s stops on the way to see its allies in Latin America were higher profile than trips by previous presidents. That, analysts say, angered China. Beijing had asked the United States to cancel Tsai’s stopovers and accused Tsai of trying to split Taiwan from China. Chinese netizens called for a boycott against the Taiwanese-owned 85C coffeehouse chain, and on Tuesday Taiwan broke ties with El Salvador, which became the fifth nation in two years to recognize China instead. China claims sovereignty over Taiwan, saying the self-ruled island has no right to maintain its own relations with foreign countries. Tsai’s appearances in the United States will help her image at home, analysts say. Weary of pressure from China, Taiwanese citizens look to their leaders for foreign policy achievements with informal allies Japan and the United States. Her visits reflected improvement in Taiwan-U.S. ties that include a bill in Washington calling for more high-level visits and a first step in selling American submarine technology. Sentiment at home matters because Tsai’s Democratic Progressive Party is preparing for mid-term local elections in November, said Wu Chung-li, a political science research fellow at Academia Sinica, an academic research institution in Taipei. Her party vies with one that backs stronger ties with the mainland. A group of Taiwanese American welcome President Tsai Ing-Wen during her visit to the Ronald Reagan Presidential Library in Simi Valley, California, Aug. 13, 2018. 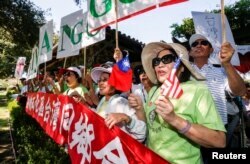 China fumes whenever Taiwanese leaders stop in the United States, usually en route to see allies in Latin America. The Communist government had little clout with Washington this time as it spars with the United States over trade, some scholars say. Taiwan’s government hit back against China’s comment that Tsai traveled to divide her island from Chinese rule. The two sides have been separately ruled since the Chinese civil war of the 1940s but Taiwan has never formally declared independence. “For the president to travel abroad, visit diplomatic allies and stop off in the United States, accepting the invitations of relevant institutions, is a natural, normal and deeply meaningful matter,” said Chiu Chui-cheng, spokesman for the Taiwan government’s Mainland Affairs Council. During the Los Angeles stopover, Tsai visited a store under the Taiwanese-owned 85C Bakery Café chain. The news prompted Chinese netizens to call for a boycott against the chain’s China outlets. The bakery-cafe chain this month posted a statement saying it backed the 1992 Consensus, Beijing’s condition for Taiwan-China dialogue that could eventually cover the issue of political unification. The condition requires that both sides talk as part of a single China. Tsai rejects the policy, which critics say Beijing uses to assert its claim over Taiwan. Taiwanese President Tsai Ing-Wen standing by a section of the Berlin Wall speaks to media at the Ronald Reagan Presidential Library in Simi Valley, California, Aug.13, 2018. Chinese netizens have boycotted other offshore-based businesses over politics, damaging South Korea’s tourism sector in 2017 over Seoul’s plans for a missile shield system that could also see into China. On Monday, Taiwan announced it would sever ties with El Salvador over financial requests that it couldn’t match. Countries that cut relations with Taiwan normally establish them with China, which offers economic support that Taiwan cannot easily afford. Only 17 countries have formal relations with Taiwan now, compared to more than 175 that recognize Beijing. Chinese President Xi Jinping is going all out to limit Taiwan’s international exposure, said Liu Yi-jiun, professor of public affairs at Fo Guang University in Taiwan. “I think the current relations between Taiwan and China are under great, great stress and it doesn’t matter what kind of things would happen,” Liu said.